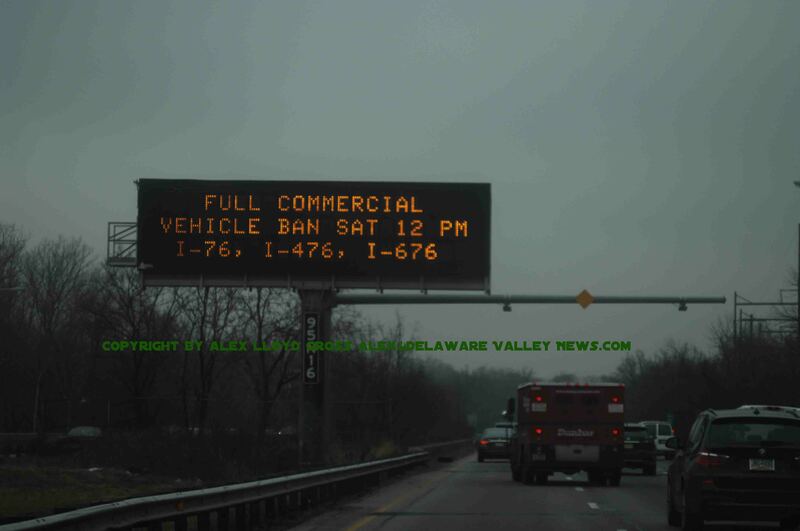 Alex Lloyd Gross- Photo- Delaware Valley News.com, This sign is giving advance warning for tomorrow. All tractor trailers, tour buses, and tow behind vehicles are banned from Pennsylvania highways from noon on January 19, 2019 until January 20, 2019 at noon. This is to insure they do not get stuck or become involved in massive wrecks. High winds can cause a tractor trailer to flip onto it’s side. The only road that these vehicles can operate on is I-95. Drivers that are found to be on the road risk fines attached to their license. 676, The Pa Turnpike, 476, Routes 33, 22 and 78 are all included in this ban. Surface streets are not affected. The National Weather Service has predicted snow and ice. Just how much is anyone’s guess. The storm is expected to last until Sunday. Due to the unpredictable nature of this storm, this vehicle band could be expanded to include all vehicles, or possibly downgraded.